Learning and performance in work are becoming so integrated it’s hard to know what a ‘learning technology is’ any more. I’ve been thinking about how I settled on the one that I’m using to take The Smart Work Company into the next phase, but not before I made several mistakes. I’m not sure we ever really learn from the mistakes that other people make but maybe mine will encourage you to take on board that its not primarily about the technology – of course. It helps if you know exactly what it is that you want to achieve. I’ve always known what I wanted to do in a high-level, vague sort of way. That’s not good enough. You will, I know, already be well aware that the pace of change in the business environment is happening at warp-speed. Personal skills and organisational support systems will need to adapt to these turbulent conditions. As well as challenges, I think this presents huge opportunity to individual people who are willing to commit to “sharpening their own shovels”, and to organisations to create performance conditions that let the phenomenal connected knowledge and capabilities of these people flourish. augmented by group and personal reflection on progress – what might be happening? Why? What could be done differently? Adjust as necessary. I found it useful at this stage of writing the post to remind myself of all the possible ways that people can learn at and through work. synchronously (at the same time) and asynchronously (in our own time). The pilot programme I’ve developed, Innovating Through Tiny Triumphs, brings people together to explore, experiment and share experiences. What will people be guided to do? For what purpose? The focus of this phase is discovery. The aim is to find possible things to do. Activities look out into the business environment, and also look inwards to how workforce performance is supported. What’s happening? What does it mean for skills and performance support? What needs to change? What options are there for doing something? The focus of this phase is developing the personal skills and capabilities that people will use to complete a practical experiment. The expected outcome is an innovation to a work process, or to some feature of performance support systems. The Develop phase looks to the future. What are the next step? What’s beyond that? Diagnose, Do Something, and Develop are the top-level headings. A number of sub-headings sit under them, and they all follow the same format – Five Themes, Three Activities, and One Hot Topic. do something with work colleagues. What I’m proposing is a mix of in-the-flow sense-making as an experiment unfolds, complemented by a structured ‘time out’ approach for individual people and groups to think and talk about what they are experiencing. As a fan of Slack, I was interested to read this interesting article that Lee Bryant published last year on the history of chat and activity streams. It was the first time I had come across the term ‘Chat Ops’ to describe Slack and other chat tools. “an activity stream into which various updates and events could be shared in a social, sense-making context”. Social sense-making could also be seen as in-the-flow learning. It’s how I see it. This was one of the reasons why Slack was initially a strong favourite for what I wanted to do. The other reason was that I thought that the channels and private channels in Slack would allow me to create the scaffolding structure that is so important in what I want to do. It allows me to create a structure, a loose scaffold of phases and learning activities to guide practical, self-managed and peer-supported learning experiences. This will make it easy to customise and co-design scaffolded programmes with clients, to reflect their unique business contexts and constraints. It is a doddle to use. It facilitates social learning – discussing, sharing, co-creating together, and learning from each other. At the same time, Noddlepod lets people keep their thoughts to themselves. I think it is important for people to have a private space to think, if they prefer. They can make their thoughts public later. As well as enabling social and solitary activities, I think Noddlepod will be able to support the in-the-flow and time out learning activities that I’ve included in the pilot programme. An example of in-the-flow support could be asking for suggestions, advice or ideas from peers in the learning programme about something that has come up in connection with an issue at work. For time out activities, I could use Noddlepod to generate discussion in preparation for a workshop, or use it to carry on conversations afterwards. I wasn’t sure about Noddlepod to begin with. It felt basic and simple. That turns out to be a strength, though. Being lightweight makes it easy to use. The combination of being able quickly and easily to create an enabling structure, plus the ability for people to keep their thoughts private convinced me. The personal and warm support from Ollie is a bonus. Noddlepod lets me do what I want to do. I’m still a fan of Slack, though. Writing this post has made me think that one of the activities in the pilot could be to suggest that people consider Slack as an option with their work colleagues, to make sense of what they think is happening with their work-based experiment. I didn’t find it straightforward finding a technology that fits the bill, and made a few costly mistakes along the way. Mainly this was because I was not crystal clear on why and how I was going to ask people to use it. I think I’ve learned from my own mistakes. At last. 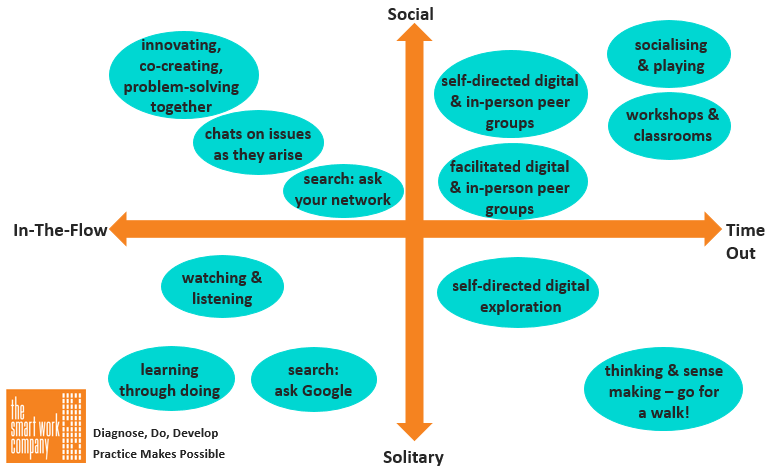 I really like the learning model you’ve got above – with the four quadrants – is this your own creation? It is inspired – I’d like to borrow it, with attribution of course! The framework is great work, so I’m glad I have this at my finger tips now to reference! Will credit you of course!